Its been a while since I posted, which I'm afraid is a symptom of it being difficult to find the motivation to update when you're running bad. It's the old "You only sing when you're winning" scenario that my mate Cos blogged about recently. I recently incurred a ~150 buy-in downswing, which I guess I have to get used to if I'm going to play 180-man tournaments. I've got myself out of this one, so I'm feeling better things than I did on the "trough" stage of my graph! Standard variance really should affect me as much as it does emotionally, but at least I don't let it affect how I play (except for perhaps self-reviewing a little more, which can only be a good thing anyway). I spent approximately a week trying to find a set-up that allowed me to play on PokerStars and Full Tilt at the same time. Sadly, despite a whole bunch of effort trying numerous configurations, writing a bunch of code, and trying different programs, it just tilted me too hard so I've given up with it. At one point using the StackAndTile software looked like it might be the best method, but it's not really refined enough and it seems it's written by a guy with not much time to develop it. So after all that dicking about I'm back on PokerStars doing exactly what I was doing before I started dicking about. So I wasted a whole bunch of time, and the distraction probably contributed in some way to the aforementioned downswing. Although I wish the games were a little softer, the truth is PokerStars is just too smooth for multitabling. The software is just too good, TableNinja is too good and Hjälper looks like it's set to become awesome sometime soon. 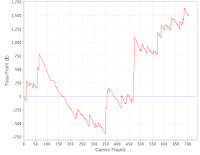 I've talked about my poker playing schedule numerous times. The best traffic comes in the evening in the UK, so I have decided that is when I have to play most of the time. One way I've found around being too tired to play in the evening was to have a 1-2 hour power nap/siesta in the late afternoon. It definitely seems like a decent schedule, but it seems it wears me out, as 6 hours sleep at night + 2 hours nap during the day doesn't seem to equate to a solid 8 hours sleep straight through. One problem is I'm one of those people who is "Fooled by Randomness" (a book I was recommended that is on my 'awaiting to be read list'). I was running bad the whole time I was on the Siesta schedule, then I woke up at 1.30pm on Tuesday, thus preventing me from having one, and I got myself out of the hole that day. It's very likely the too things are unrelated, but I'm suddenly giving the waking up in the early afternoon thing a go. I might as well wear the same clothes because I think they were lucky ffs. Recently there has been a bit of controversy surrounding Nick "MI_Turtle" Rainey. He is someone I've followed for the last year or more, largely because of the ridiculous amount of success he has had playing games similar to me. So as a poker player he is certainly someone I look up to. However, he does come across as being rather arrogant at times, and it seems the 2+2 community have taken offence to this. There is a thread dedicated to him, which at times is just downright abusive, that came about after he tweeted about his disappointment that PokerStars declined to give him a patch during his deep run in the Main Event, due to his account being flagged multiple times for collusion. Apparently this is pretty standard for high volume players (I guess when you misclick fold getting 30 to 1 on a call last to act, and shove on people with rags when you're in the money and someone else is all-in for an underbet, you risk getting reported by random donks, and I certainly do both of those things, by mistake and on purpose respectively) and the flags were completely unfounded. I'd understand him being very upset considering how hard he grinds on PokerStars, but his reaction since that hasn't exactly been endearing. He's quitting PokerStars, ending all his staking agreements with all or most of his horses, temporarily shutting down his training website and has made a few tweets where he doesn't come off all that great. Obviously he reserves the right to do any of these things (tbh, I understand the reasoning for wanting to quit PokerStars, but meh, winning money at poker>principles imo) but even though they might seem a little childish, some of the trolling that has resulted on the 2+2 forums seems rather out of hand. Having said that, Nick doesn't do himself any favours, as he seems to often make overly arrogant comments, apparently just for a laugh...but I don't think anyone is really laughing. There are some interesting points to come out of the thread, for example I wasn't aware of the dodgyness surrounding his 16,000 SNG prop bet last year, which was how I first learned of him after Daleroxxu posted about it on Blonde. Also, a couple of people who have had business dealings with him recently speak of him not too highly. I'm not really sure what to think, but then again it doesn't really matter as I'm unlikely to have any dealings with him apart from tweeting him and donking off all my chips to him in a SNG :) It's made for compulsive reading over the last few days, hence why I'm blabbing on about it here, and the jury is out whether he is a nice guy or not a nice guy. Either way I'm sure he'll get back to crushing soon, and if he wants to do that somewhere else other than on my 180-man tables then that can only be a good thing for me! 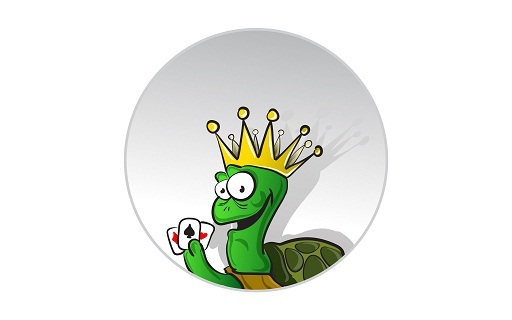 2 Comments to "Downswings, Siestas & MI_Turtle controversy..."
What was the dodyess in the 16,000 prop bet? From what I can gather he basically stopped playing at $9,300 because he thought he had an extra ~$1.2k in bounties from the 90-man KOs, (which Sharkscope doesn't monitor) to put him over the $10k. However, he forgot to subtract the buy-ins for these bounties (which Sharkscope also doesn't monitor) which cost him around ~$1k so it was certainly arguable that he lost the bet. It seemed like he kinda hustled everyone along the way as well.